Their biggest worry, said McKnight, who had worked as a wheelchair attendant at Philadelphia International Airport for more than seven years, was job security. They could get fired for a seemingly small infraction — you took too long getting from one place to another, or you didn’t answer the radio when called — and there was no way to fight it. “You’d go into work being on pins and needles over the course of the day,” McKnight remembered. Then there was pay. McKnight, now a 62-year-old grandmother who lives in Southwest Philadelphia, made $5.75 an hour plus tips. But she wasn’t allowed to tell passengers that she relied on tips as part of her salary. Six years later, after numerous high-profile rallies and strikes, McKnight and her 1,500 coworkers — largely black and brown people living in Southwest Philadelphia who clean the planes between flights, who help retrieve bags off the carousel and take them to the street, who assist the elderly and disabled — finalized their first contract Friday, winning a minimum wage of $12 an hour, with an increase to $13.60 in two years. A new disciplinary procedure says the “punishment must fit the crime,” and provisions are in place to protect their jobs if their employer loses its contract with the airlines. The airport workers’ victory is significant in this increasingly embattled era for labor, when union membership is at an all-time low and labor advocates worry that the Supreme Court will again rule against workers in a case that could allow public-sector workers to be represented by a union but not pay dues. The only other union adding that many new members was the Pennsylvania Association of Staff Nurses and Allied Professionals, which grew by 3,000 health-care workers in 2016 at five hospitals. Most labor unions are not trying to organize new members right now, or not doing it at that scale, because it’s expensive, time-consuming, and risky (case in point: the airport workers’ campaign took six years from early organizing conversations to a first contract). Instead, most unions are focusing resources on protecting the rights of the members that they already have. Here’s what helped the airport workers get their contract. From Dulles International in Virginia to JFK and LaGuardia in New York and Newark Liberty in New Jersey, low-wage workers are unionizing in what Bloomberg called “a rare bright patch” in the “bleak landscape for private-sector union drives.” More than one-third of these kinds of workers are living in or near poverty, according to Ken Jacobs, chair of the Labor Center at the University of California-Berkeley, who said that raising wages improves worker turnover and passenger safety. The wage requirement in the airline’s contract was a way to tackle what Jacobs calls “the relentless downward pressure on wages” that subcontracting produces. This way, airlines couldn’t simply choose a contractor that paid its workers less and delivered services for a lower price. American spokeswoman Victoria Lupica said the airline chooses its subcontractors on more than just price — it’s a matter of who can do the job the best, she said. 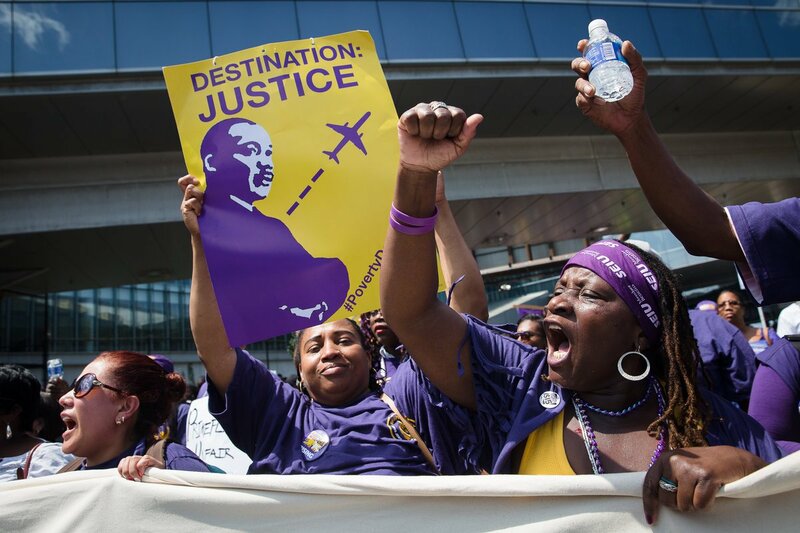 Weeks after he was elected mayor, Jim Kenney joined airport workers when they walked off the job in November 2015, saying: “You have every right to collectively bargain with your employers. That’s how this country was built. That’s how this country is going to be.” Council members came to the rally, too.